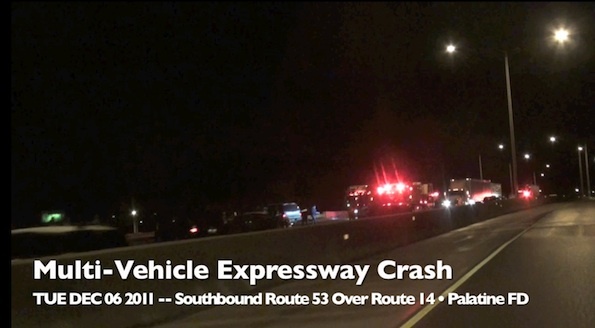 VIDEO: Multi-vehicle crash on Southbound Route 53 over Northwest Highway (Route 14) in icy conditions. 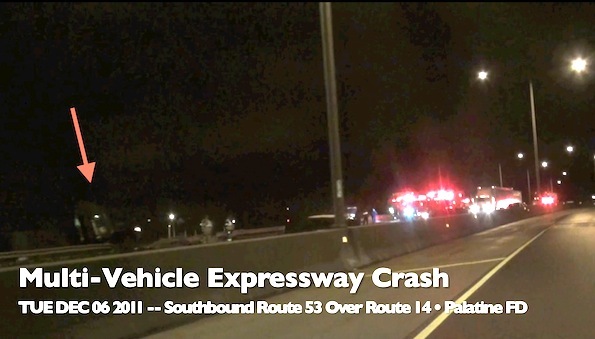 Illinois State police and Palatine firefoghter/paramedics responded about 3:55 AM Tuesday to a reported nine-vehicle crash on southbound Route 53 on the bridge over Northwest Highway. A UPS semi-trailer tractor hit the guard rail and was hanging by the guard rail over an embankment near the Harvest Bible Church in Rolling Meadows. At least two people were injured, but the injuries did not appear to be serious. At least two people also signed releases from paramedics. Southbound Route 53 traffic was diverted to exit at Northwest Highway. Most people were taking Westbound Northwest Highway and driving South on Rohlwing Road to westbound Industrial Avenue or southbound Winnetka Avenue to southbound Hicks Road, and entering Route 53 southbound at Euclid Avenue. Firefighters cleared the scene at about 5:30 a.m., but police are waiting for IDOT to specifically salt the bridge because of icing conditions before re-opening southbound Route 53. Police re-opened southbound Route 53 about 6:05 a.m.
UPS truck hanging over guard rail. Multiple vehicles scattered from shoulder to shoulder on southbound Route 53.